An Insane Design Bundle & Tons of Freebies! Back in May we showcased a list with 60 Excellent Examples of Illustration in Web Design and since illustration is always something inspiring we decided to gather a new list to check out some fresh examples of illustration in web design. 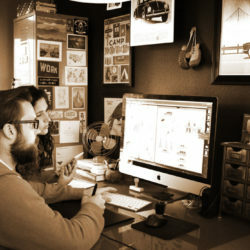 The great thing about web design is that we have an enormous range of styles, techniques and ideas to implement when designing a website. You can go from Super Clean and Minimal Layouts to Colorful Layouts, and you can use Huge Typography or Hand Drawn elements, as long as you keep your style and give your website your own personality. As illustration is somewhere in between those options and is something that can give your website a very unique touch, we decided to gather a selection of illustrated websites to inspire you.